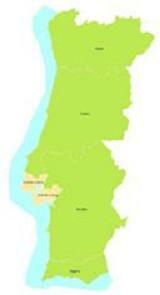 The Lisbon Metropolitan Area leads all of Portugal in terms of population and economic figures. Within its eighteen municipalities, representing 3.2% of the country’s land area, reside almost 3 million people, about 1/3 of the Portuguese population. In economic terms, 25% of the work force is concentrated here, as well as 30% of the domestic companies, 33% of the jobs and a contribution to the country’s GDP that surpasses 36%.